In the near future, thirty kids, residing in the territory of the dairy and jamoata stock-raising farm in the Obburdon Matchi rayon of Sogd Oblast of Tajikistan may be cut the access to education. The farm with the population of more than 300 residents is located in the hard-to-reach area. The mountain road, leading to the dairy farm, has not been repaired for 18 years. There is no public transportation here and rare driver will risk driving here after snow. 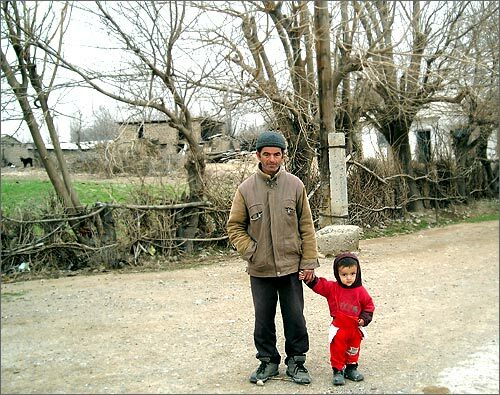 Therefore, the only teacher of the school, bearing the name of great poet Firdousi, has to walk 11 kilometers every day to reach his students. Domullo Jalilov is little over thirty and he graduated from geography department of Hudjant state university. In the small school he teaches alphabet, Tajik language and reading, math, handicraft lesson, singing, drawing and physical training. He prepared the study plan independently because his workplace is special. There are only two so-called “universal” groups, each attended by 13 students among 76 school age residents of the farm territory. There are two shifts: 8am-12pm for the kids 11-15 year old and afternoon is the class time for younger, of 8 to 11 year old, kids. Both groups study the elementary school program level. After graduation from school they get the certificates, verifying the completion of 4th grade. One can assert that Mr. Jalilov works on enthusiasm. Last time his picked up his small salary in November of 2008. The village teacher shares with the correspondent of Ferghana.ru that there has been no school institution in Obburdon jamoat for 11 years and the local kids never attended the school since the closes general education institution is located very far from the farm. As a result, more than 20 kids are illiterate. Today, they are not even able to write their names or put signatures. They are 15 to 18 years old and they are shy to study with little kids. Last year, Mr. Jalilov launched 2-month courses for these kids in order to make them learn something. “Once they leant to write down their names, they left the course”, the teacher says. In September of 2007 it was decided to launch couple courses, renting out the private house. However, the owner of the houses stated that he got nothing for the lease. “I temporarily left the house so that our kids could get education”, he explains. - We are aware of this problem – Abduvohid Kurbonov, Matchi rayon deputy department head for civic education, tells Ferghana.ru – We try to keep an eye on them. We will somehow organize the transportation for kids, or extend the duration of rent or rent another house”. According to Mr. Kurbonov, until 1998 when there were collective farms, the kids were transported to the secondary school, 11 kilometers away from the farmland. However, after the collapse of collective farm system and their split into smaller farms, nobody took care about the education for children. The farm resident Khusein Bokiev tells us that two local guys recently returned from military service. During two years of service none of them sent messages home – both are illiterate. Last year, the local entrepreneur Mirzozarif Homidov wanted to construct the school building, but he faced the ban from local administration. The Head of Matchi rayon Abdukarim Hikmatov says “the point is that there are no dry and pasture lands in the territory of the farm, where we could authorize the construction. All land here is put under the category of irrigable land. 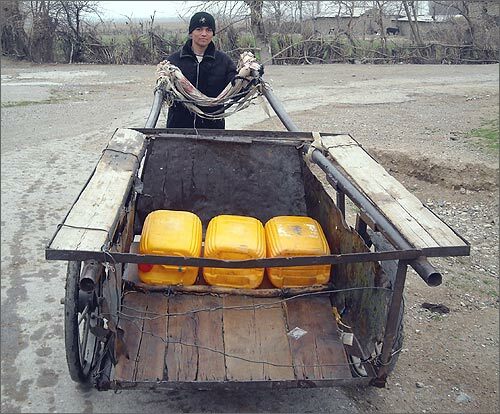 In accordance with laws of Tajikistan the construction of any erections, including schools and hospitals, are prohibited at the irrigable land. According to Mr. Hikmatov, besides, the local school, named after Firdousi, there are also other three schools and thirteen first-aid posts, accommodated in the private houses. He explained that when people were moved to these territories, there was no need to build such buildings. Once the republican budget stopped the financing of rayon in 2003, the local administration has accumulated big debt. It would wrong to say the government of Tajikistan forgot about this region and does not make attempts to help. In 2008 the government of the country approved the program of socio-economic development of Matchi rayon till 2015 that plans the construction of new economic units. The chairman of Sogd Oblast accepted the educational development program for 2009-2011, according to which all the educational institutions, accommodated in the private houses and wagons, will be moved to modern buildings. Nonetheless, by no means all the kids of Matchi rayon attend the school. - I never took a pen and paper – 15-year old Jahongir Hasanov admits. – I am going to military service soon and I do not know how to put signature. The father insists Jahongir goes to school, but it is shameful for the son to attend classes with kids.